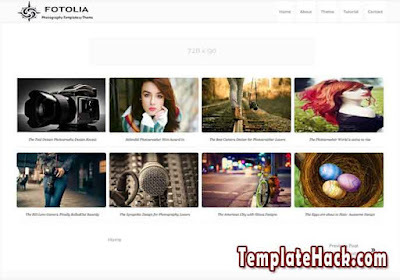 TemplateHack.com - Download Fotolia Responsive premium blogger template. Fotolia responsive is another version from Fotolia Photography Blogger Template. Booth of them has similar design on the homepage, the difference is on background color. Fotolia Responsive has blue background color and Fotolia Photography has white background color. No matter what the background color, because this template is fully customizable. You can change your favourite color to applied on the background by clicking easily on edit theme menu. Ads Ready, Breadcrumbs, Browser Compatibility, Customizable, Drop Down Menu, Fast Loading, HTML5 Valid, Mobile Friendly, Page Navigation Menu, Post Thumbnails, Responsive, SEO Friendly, Social Bookmark Ready, Social Share Button, Unique, No Sidebar, blue, 4 Columns, No Column Footer. Anime blogger template, Beauty blogger template, Download blogger template, Gadget blogger template, Games blogger template, Gallery blogger template, Magazine blogger template, Movie blogger template, Photo blogger template, Photography blogger template, Portal blogger template, Sports blogger template, Tech blogger template, Technology blogger template.